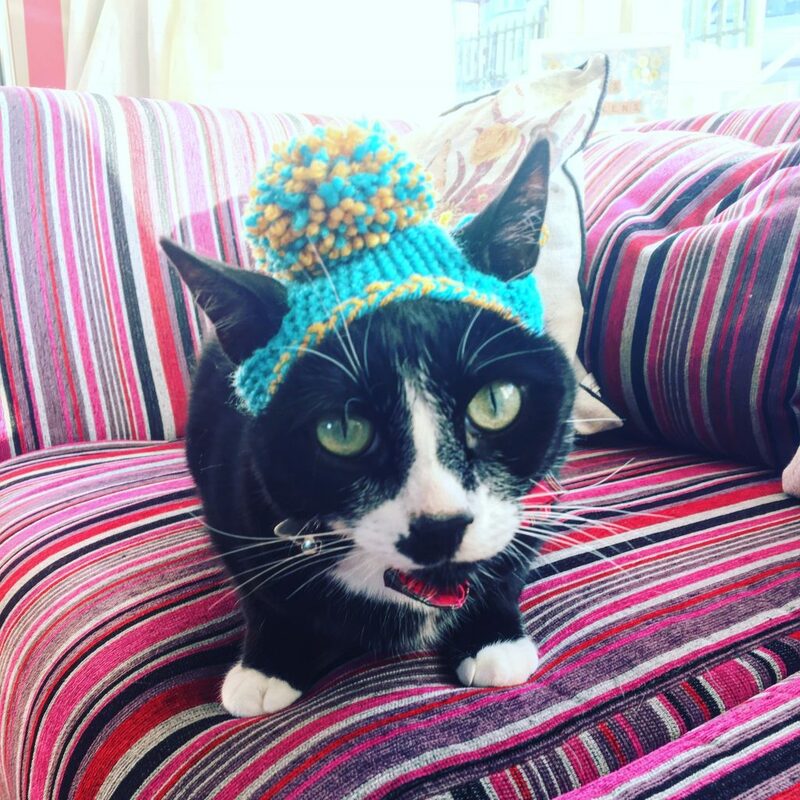 Obviously I had to have one, so I popped over to her Etsy shop and purchased Figaro his very own knitted bobble hat. 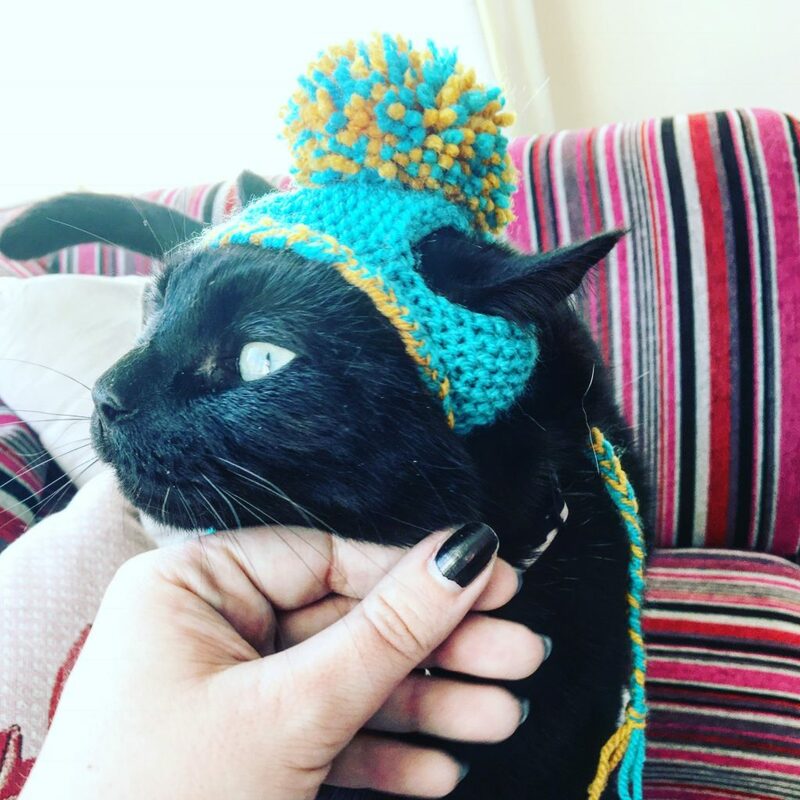 There were two options – Aqua & Mustard and Purple & Blue, the lovely Mary of Crafty Fox also told me on Twitter I could have picked my own colours if I’d wanted so you can be sure not to clash the hat with the cat. 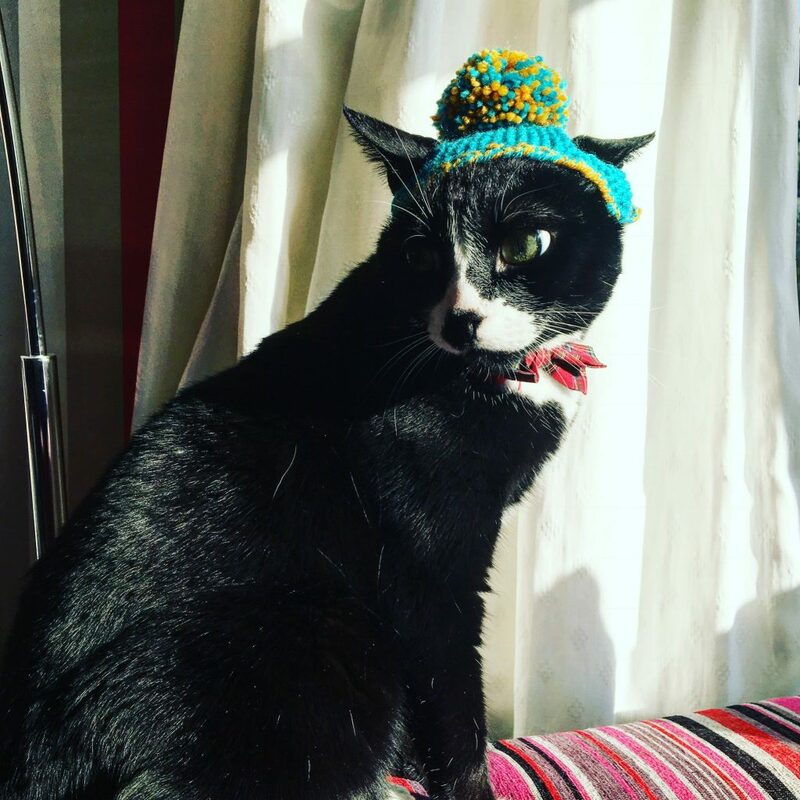 A knitted pom-pom hat for your cat will set you back £7.50 and I paid £1.00 for postage. 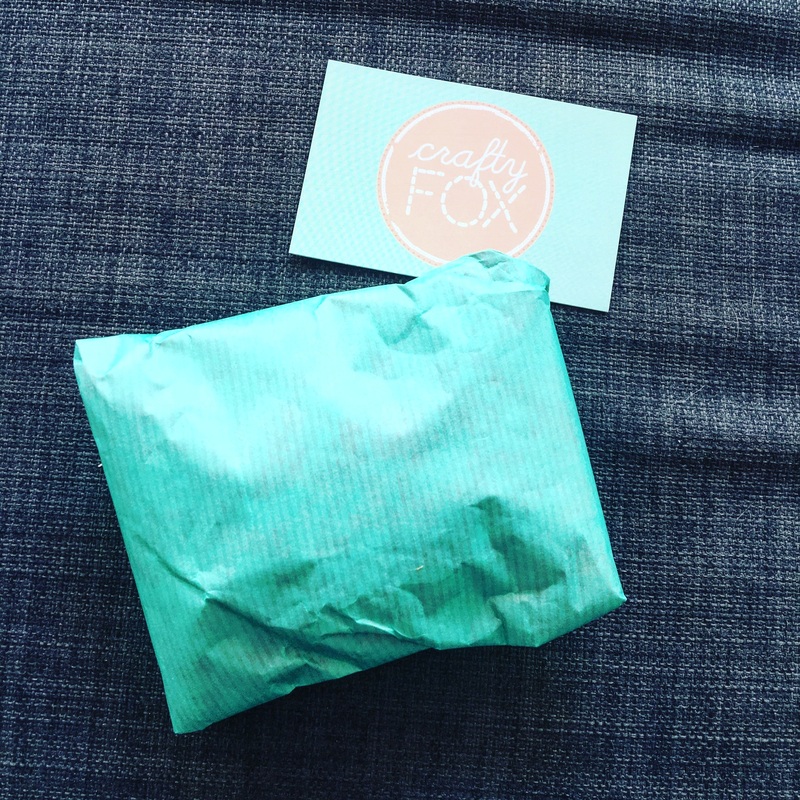 I am super impressed by the speed of delivery and the packaging and little note I got added to my joy. I love the little extra thought you get from independent sellers. 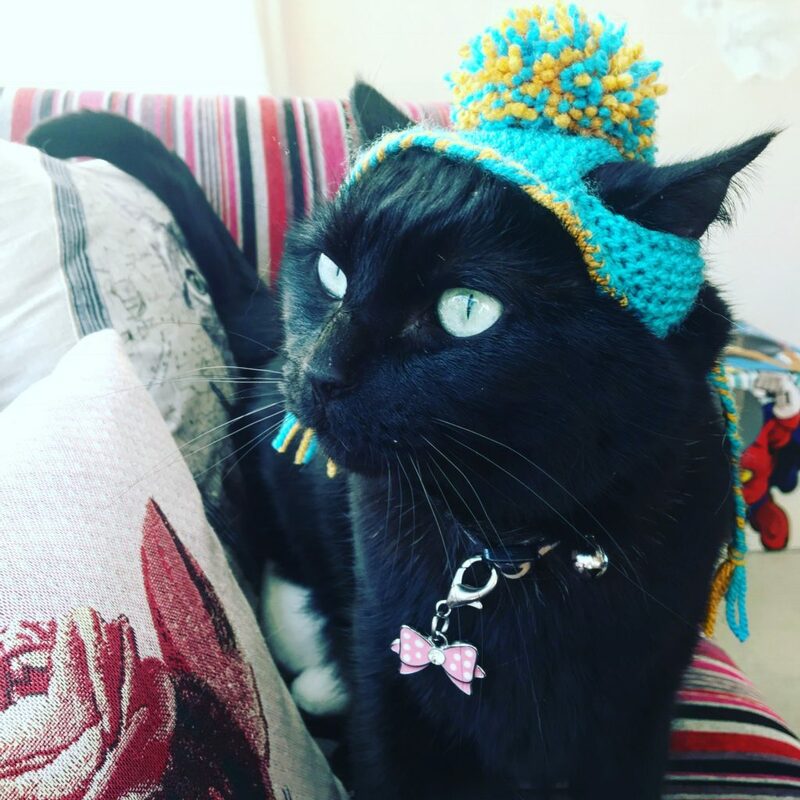 I tried the hat on Figaro first, he is generally pretty easy to dress up. Bless him. Doesn’t he look smart! I like to call the third picture “betrayal”. 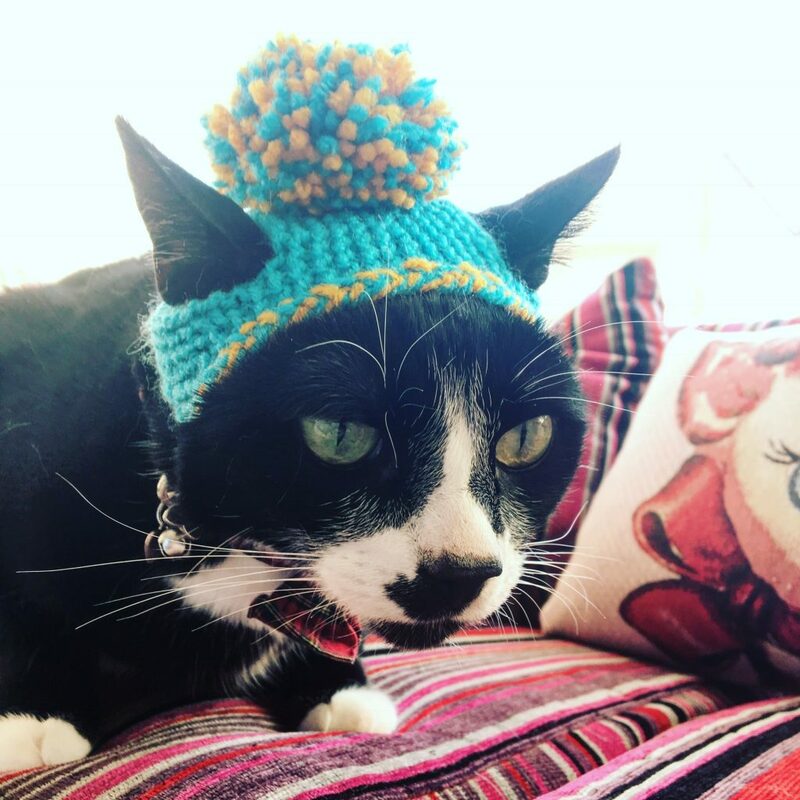 The hat comes with long tassell bits so that you can tie it under your cat’s chin. Figaro promptly tried to eat the tassells. He was happy to have his little hat on for a while and unlike when I pop a little jumper on him he didn’t pretend to have completely lost the use of his legs! Bea was next to model for me. Bea is super placid and didn’t at all mind her little hat, nor did she try to eat the hat. Last up Mallorie had a go. I was a bit wary of popping the hat on Mallorie as she knows her own mind and isn’t afraid to put her foot down. 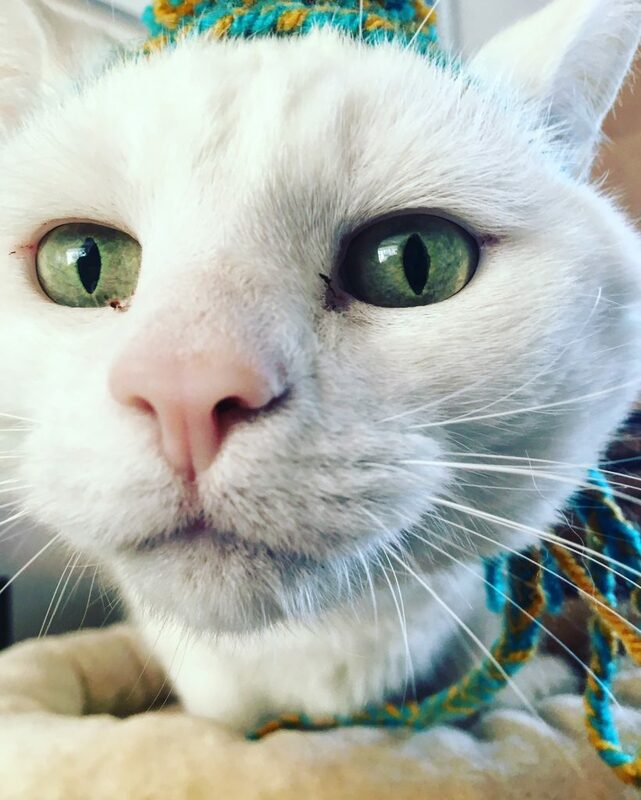 Suprisingly, she was totally fine with her little hat. She did try to eat the pom-pom though.. I am overjoyed with my purchase. Crafty Fox also sells other things in her Etsy shop like hair accessories, cross stitches and other lovely bits for your home. 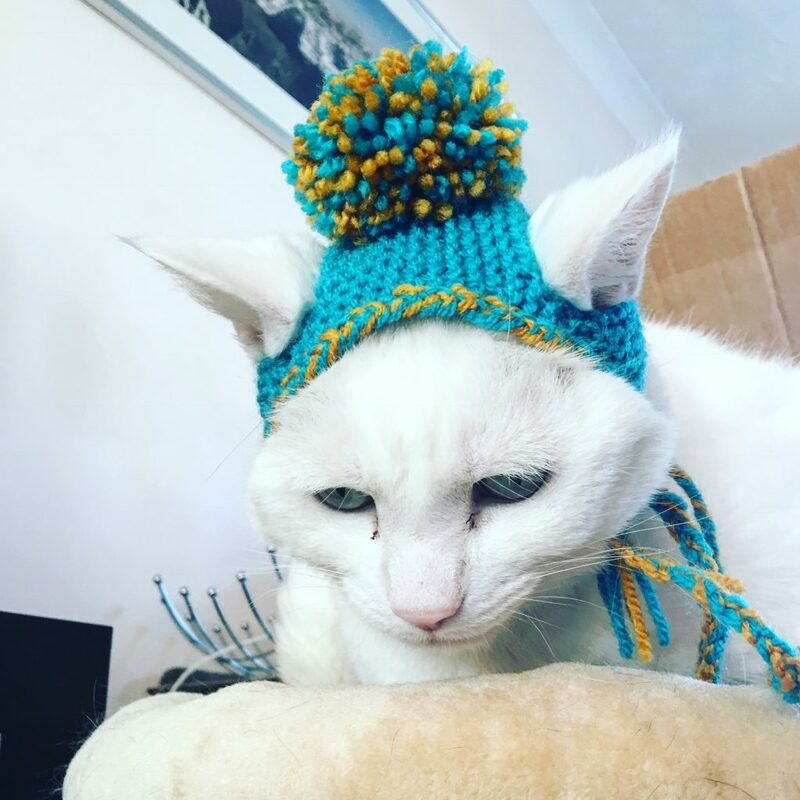 Me and the cats love their new wintery accessory. 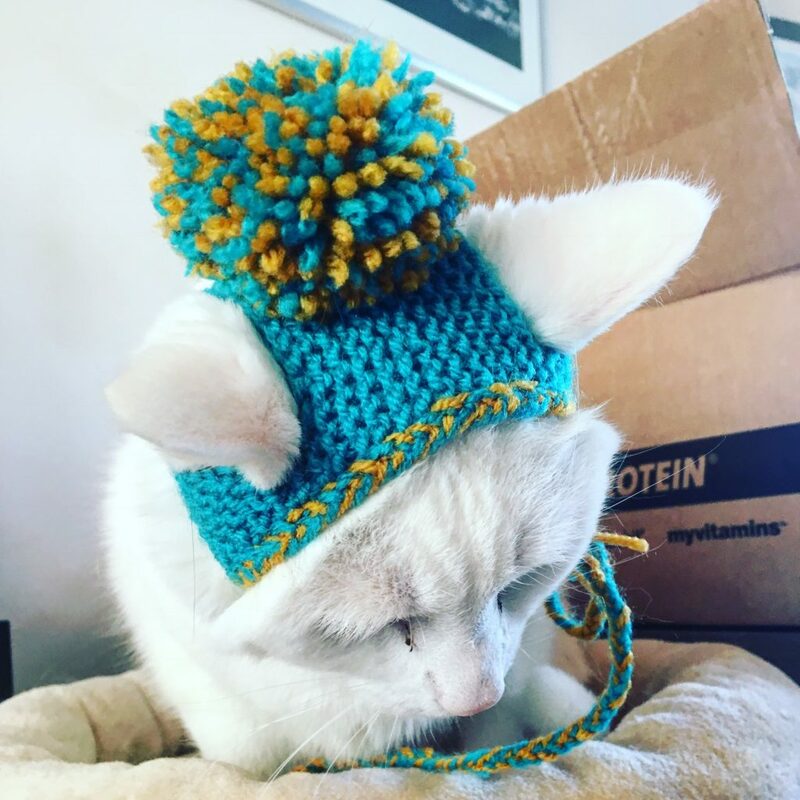 It is well made, the colours are gorgeous and it fits my cats perfectly, the ear holes are completely adorable. I wish I had a matching hat! 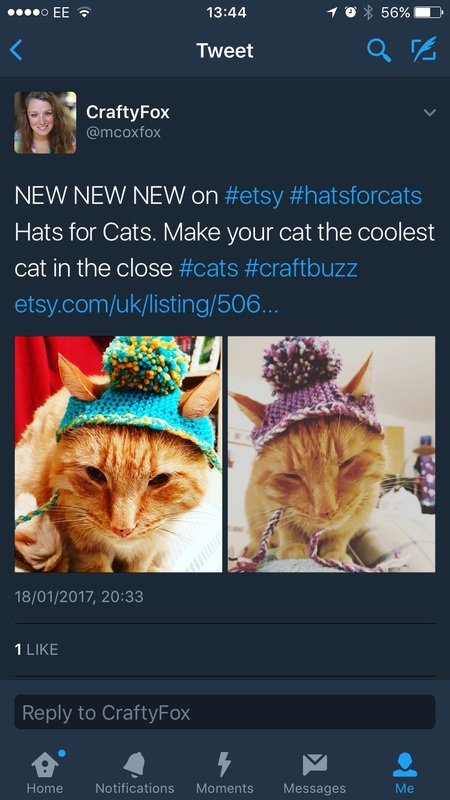 I urge you to check out Mary’s shop and buy hats for all your cats! You can follow Crafty Fox on Twitter @mcoxfox as well. 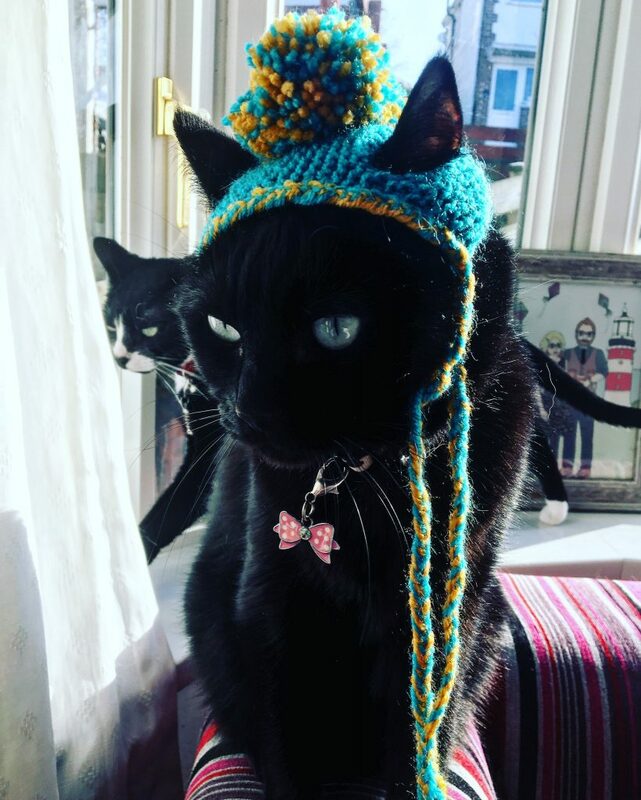 What do you think of my gorgeous cats in their gorgeous new hat? Get in touch below.